Recognizing the need for efficiency and economy in serving the growing intermodal trade, Tacoma Rail and the Port of Tacoma have completed a dramatic expansion of the classification and staging yards in the Tidelands Division. The first expansion, completed in 1998, added nine tracks for an additional 28,000 feet. Adding another nine tracks (23,000 feet). Extending existing tracks to create two arrival/departure staging tracks, each of which is more than 1.5 miles long. Adding the Port of Tacoma Road overpass, eliminating an at-grade crossing that had slowed both train and truck traffic. The third expansion, completed in 2003, added three additional staging tracks to the main yard totaling 8,000 additional feet. A fourth staging yard expansion occurred in 2004, when we added a seven-track yard, or 13,000 feet. Use of this map is for general informational purposes only. For inquiries about actual service areas and locations, please contact us. 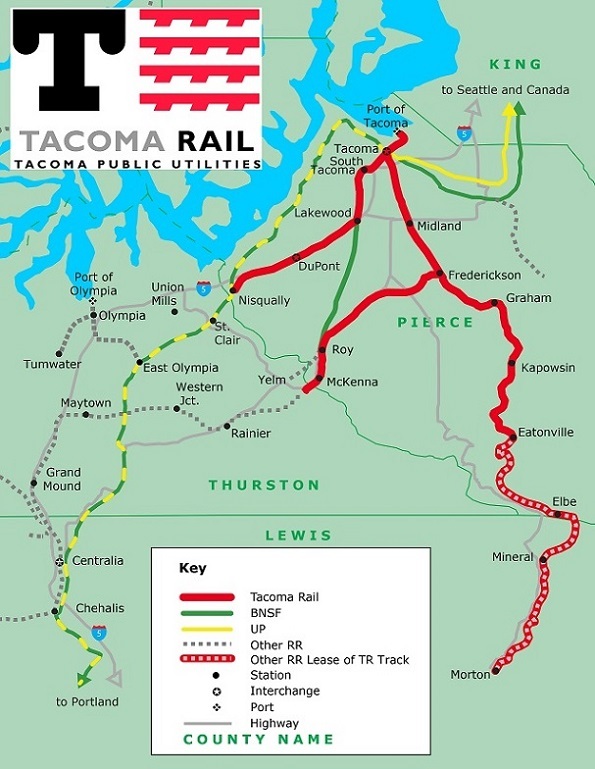 Tacoma Rail cannot be held liable for any information located on the map. Information is for educational purposes only.